Karl Denninger, with some gloomy predictions. 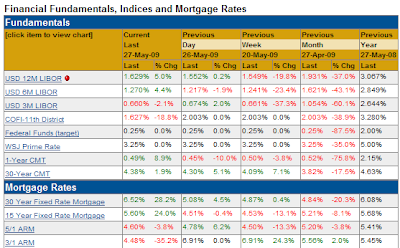 Something's amiss when the 30year mortgage rate jumps nearly a THIRD in one day, to 6.5%. NYPost discusses the upcoming $1.4trillion in commercial real estate debt that must be refinanced. AlphaNinja - IBD gathers some experts' thoughts on opportunities in the corporate bond market. While yields are not what they were in December, there are many opportunities to own 10% yields while sitting higher up the capital structure than one would with equities. That said, bear in mind a big caveat - "there is always some danger in attractive yields. Bond prices move inversely to interest rates. So investors who do not intend to hold bonds to maturity would be hurt by a general rise in interest rates. "That's one of the risks," allowed Pimco's Kiesel."